Senior counsel for the Travancore Devaswom Board, K.K.Venugopal today told the Supreme Court bench of Justices Dipak Misra, R.Banumathi and Ashok Bhushan that the case dealing with right of women to enter Sabarimala temple in Kerala involves substantive interpretation of the Constitution, under Article 145(3) of the Constitution. Under this provision, the minimum number of Judges who are to sit for the purpose of deciding any case involving a substantial question of law as to the interpretation of this Constitution, shall be five. Asked by the bench which provision requires such interpretation, Venugopal explained in detail, the Articles 25 and 26, which have a bearing in this case. According to him, Article 26, which deals with the rights of a religious denomination, will prevail over Article 25, guaranteeing freedom of conscience and free profession, practice and propagation of religion. Venugopal contended that the followers of Lord Ayyappa have been recognized as a denomination by the Kerala High Court, after examining evidence, and therefore, the doctrine of res judicata will apply. Venugopal then read out Article 25(2)(b) and asked why it does not say “all classes of worshippers”. The article, he claimed, deliberately excluded other religionists, as its focus is on ending the discrimination against Dalits within Hinduism. “It is not a blanket provision like Article 14 or 15. Otherwise, it would have said “all classes of worshippers of this particular religion”. When asked whether he is claiming privilege under Article 26, Venugopal replied that the framers of the Constitution were aware that because of Article 26, you can’t freely enter. “The discrimination is between women and women. Citing the Supreme Court’s five-Judge Constitution bench’s decision in 1957 in Sri Venkataramana devaru v The State of Mysore, Venugopal said, although the right to enter a temple for purposes of worship, protected by Article 25(2)(b) must be construed liberally in favour of the public, that does not mean that that right is absolute and unlimited in character. “It must necessarily be subject to such limitation or regulation as arises in the process of harmonizing it with the right protected by Article 26(b)”, Supreme Court had held in that case. Justice Dipak Misra intervened to say that the bench is not concerned with res judicata. Indira Jaising, appearing for an intervener in the case, described Venugopal’s contention as misplaced, and problematic. She said that it cannot be said that Article 26 overrides Article 25, because Article 26 does not make a specific mention of “subject to other provisions”. Article 26 does not exclude other provisions like Articles 14, 15 and 16, she said, adding, “you have to opt for a harmonious reading of all provisions”. Jaising then argued that even if the followers of Lord Ayyappa are a denomination under Article 26, whether the law excludes women of the same denomination, is another issue to be determined. Justice Dipak Misra then told Venugopal that while right to enter temple is not absolute, “you can’t restrict the entry all the time. Partial restriction is fine, but Article 26 denominational rights have to yield to Article 25(1). Venugopal then justified the restrictions on entry of women, saying the male devotees, practice brahmacharya, by living separately, and cooking their own food. The bench then asked whether every Aiyappa temple imposes such restrictions on women, and was told that the bar on women is only at the main shrine, “where the God himself said”. “Every other temple, ladies can go, but not this”, the bench was told. V.K.Biju, counsel for one of the interveners, then began to justify the restrictions at Sabarimala in spiritual terms. Justice Dipak Misra then said that this is not within the domain of the bench. “No doubt God is present everywhere. There is a distinction between religion and spirituality”, Justice Dipak Misra observed. Justice Dipak Misra then explained that the issue is whether a tradition, or custom, or a religious practice followed for centuries by a religious denomination would conflict with the faith in the Constitution, Constituitonal morality, and social morality. The reference to Constitution bench may be justified because of the complexity of the issue, he said. Whether it suits the petitioner or respondent is absolutely inconsequential. Whether the State or the Government can withdraw its affidavit, and adopt contradictory stands. (He was referring to the Kerala Government’s decision to stand by the first original affidavit, and disown the one filed by the Congress Government, supporting the restrictions on women. In the last hearing, Venugopal had argued that the Government cannot be allowed to change its stand.). The meaning of the word “custom” as used in Article 13(3)(a). The petitioner’s counsel said what is a custom is an important legal issue to be determined. When the respondents said the State should maintain a principled distance from religion, petitioner’s counsel said, secularism does not mean that. Assuming the temple is a denomination, whether such a practice was prevalent earlier. Who is the competent authority to determine such a custom? Can Article 25 be sustained, assuming there is a custom. 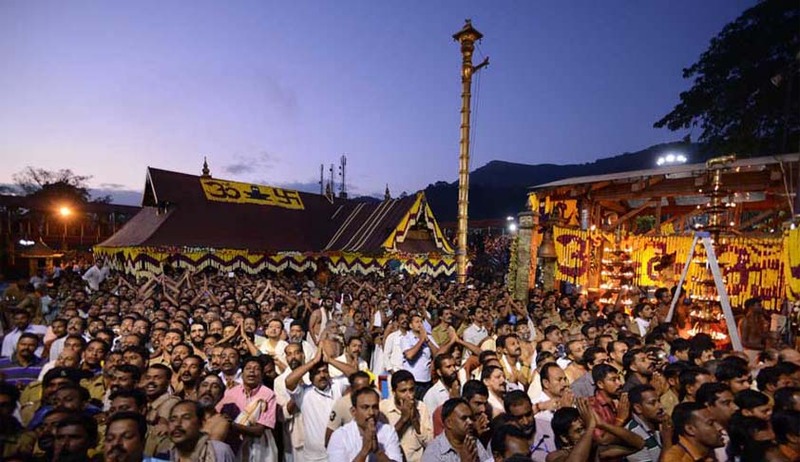 When Venugopal said the Act passed by the Kerala assembly bars women devotees’ entry into the temple, Gupta said the question is whether it is also barred by custom. The bench then said it will pass a detailed order whether the case requires reference to a Constitution bench or not. The bench permitted impleadment on behalf of Sabarimala Custom Protection Forum, which has filed IA No.31, A.R.Banerjee, who has filed IA No.32, All India Kerala Brahmin Federation, which has filed IA No.33, and All India Democratic Women Association, which has filed IA No.34.